I was at a wedding last summer for dear friends and Momma Maggie made an off hand comment about the lantern on the center for the table being just what she wanted for her porch in the summer. The only problem being that it was a light metal color (see below) and she really wanted a darker finish. At the end of the night, the table insisted that I take the lantern, saying that they knew I could do something fun with it. Of course I could try! It quickly got busy planning and crafting for my very own Picnic with a Judge (PWAJ) and then it quickly got quite rainy and then too cold to use spray paint (Really your only option when refinishing metal if you ask me.) so the lantern sat inside until it was nice again. 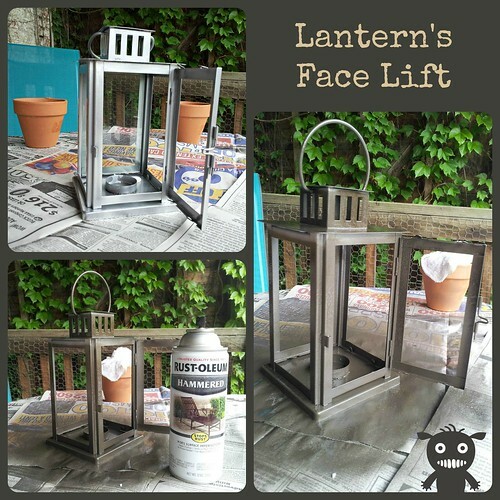 Right before Mother’s Day, I found my dark bronze spray paint, looked at the lantern and knew that Momma Maggie would be thrilled! First I covered my table and weighed the paper down so it didn’t blow away. Then popped all the glass panes out and set then aside so they didn’t get dirty. I used a sanding block to give the current finish some grip. After getting the nooks and crannies, I used a damp cloth to wipe the dust off. I spray painted it in several coats, letting each one dry for about 40 minutes in between. (Note: Humidity will change how long it takes to dry!) After making sure all the light silver was a nice dark bronze, I carefully cleaned the glass, put them back inside the lantern and wiped my finger prints off again. Done! I think the whole thing took about 2 and a half house total but I was working on something else while it dried so it wasn’t like I sat there watching paint dry. Although dry, I didn’t wrap it in case it was still tacky. I was so excited that Momma Maggie would LOVE it (and she did!) I forgot to take a photo of the final product. I’ll send Momma over to her house for a photo when she gets a chance. There you have it. Now it is the perfect lantern and the right color.